Tom provided a few third person details on his chase, noting he was “in the San Diego, California area shooting a review of the third generation Kia Soul when he spotted two C8 mid-engine Corvettes in camouflage streak by. Hopping into the Kia, he and his drive partner thought they would snag a few iPhone shots. 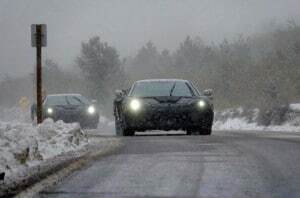 Then they looked behind themselves and found that three C8s and a Porsche 911 were following them in the snowy conditions. Voelk jumped into the back seat, pulled his Sony DSLR from the cargo hold and shot the cars in action. After decades of stop-and-go efforts, GM is expected to formally unveil the C8 this spring. “They ended up catching up with the Corvette team and getting some video of the cars at rest but couldn’t get close enough to catch a view of the interior. Voelk says “even wearing the camo, the car has quite a dramatic presence in person with a very low and wide silhouette. The nose is particularly striking with a steep rise”. It’s clearly a clean sheet approach with a very different look than the C7 Corvette that was running with the group. It’s become something of a game, General Motors executives continuing to deny, or at least look confused, when the subject of a mid-engine Corvette is raised. But you can occasionally get a whispered – and very off-the-record — confirmation and a satisfied smile knowing that the bowtie brand is finally moving on its European competitors. And, perhaps just as importantly, it is living up to the one unfulfilled goal of Zora Arkus-Duntov, the Belgian-born father of the Corvette, who long dreamed of developing a mid-engine world-beater. GM has made a number of runs at a mid-engine Corvette, showing off this concept version in 1970. 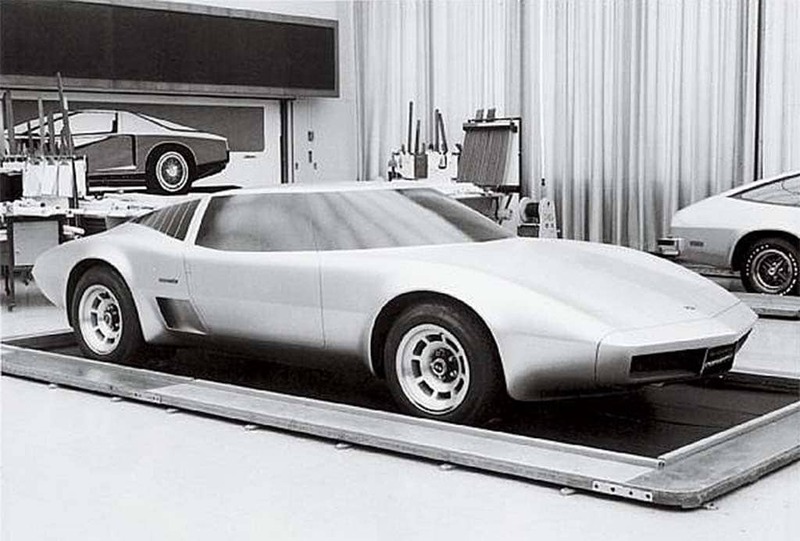 GM showed off a 1970 prototype that was reportedly production ready, but unexpectedly cancelled the project. The project came back to life several times, most recently in 2004, when GM “car czar” and global product development chief Bob Lutz kicked it off again. As it turned out, the entire Corvette program was in serious jeopardy by the time the Great Recession began in 2008. With the automaker forced into bankruptcy, the mid-engine project again was scrapped and even the conventionally designed C7 was put on hold for more than a year. Tom gives a good description of the C8’s low, long and wide looks. Meanwhile, you might notice the unusual shape of the glass hatchback. But there are plenty of questions about whether a targa roof or convertible version will follow the new coupe into production. There are, indeed, plenty of unanswered questions, including whether the C8 will stick with an automatic gearbox or add a manual. Several media reports have focused on a recent GM patent application for a clutch-by-wire system that could prove useful considering the transmission is mounted in the back of the C8. Then again, other sources insist a dual-cutch gearbox will be the final choice. There are plenty of unanswered questions about the C8 Corvette, including price and powertrain. Perhaps the single biggest question concerns the engine. There have been any number of rumors, some suggesting GM is working up a dual-overhead-cam V-8. Don Sherman, who has spent decades chasing rumors of a mid-engine ‘Vette – and who finally has caught it – wrote recently that the C8 could use an upgrade of LT1 V-8 used in the current Corvette Stingray and Grand Sport models. He is predicting a jump from the current 461 horsepower to 600. That would nab a record as the most powerful factory-built model ever to use a naturally aspirated V-8, (as opposed to the Dodge Challenger SRT Demon which needed a massiver supercharger to blow out 840 hp). Some of our sources have suggested Chevy may follow the same route as it has taken with earlier Corvettes over the decades, launching with a relatively modest number – if that word could be used for 600 hp – and then roll out ever more powerful versions that truly challenge classic mid-engine competitors like Ferrari, Lamborghini and McLaren. The good news is that the layout of the C8 would allow it to put a lot more power to the pavement than even the latest Corvette ZR1 which has climbed to an astronomical 755. 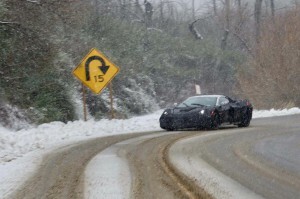 The timing of the C8's debut is also uncertain and may have been delayed by wiring problems. Finally, there’s the question of pricing. Sherman, who has written more about mid-engine Corvettes over the decade than anyone else, is looking at a possible base price in the mid-$70,000 range. Some other reports have the figure bumping up closer to $150,000. That could, of course, just be confirmation that the mid-engine model will ultimately be available in a variety of bad, badder, baddest packages, much like today. We hope to get all the details soon. There have been some reports that the C8 project was pushed back a bit because of wiring issues. But the debut of a model promised for more than half a century could final come by late this spring. Again, for a good look at those prototype Chevrolet Corvette C8s in action, Click Here for a look at Tom Voelk’s footage. 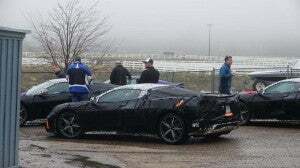 This entry was posted on Thursday, February 21st, 2019 at and is filed under Auto Shows, Automakers, Automobiles, Business, Chevrolet, Concept Cars, Ferrari, First Look, GM, Lamborghini, McLaren, Muscle Cars, Sports Cars, Spy Shots. You can follow any responses to this entry through the RSS 2.0 feed. Both comments and pings are currently closed.